In my humble opinion, the Dalai Lama is just about the best darned human being roaming planet Earth today – if there’s such a thing as a holy man, he’s truly it (little wonder, considering he’s venerated by the Tibetan people as the 14th incarnation of the bodhisattva – or enlightened being – of compassion). I’ve long admired the affable Nobel Peace Prize winner’s steadfast support of nonviolence and basic human values (compassion, forgiveness, etc. ), spiritual and political leadership of the Tibetan people, and promotion of inter-religious harmony while spreading the virtues of Tibetan Buddhism worldwide – all of which, despite a lifetime spent in the face of incredible adversity, comes delivered with an infectious laughter that can drive a chuckle out of even the most stoic of persona. 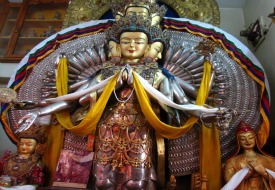 For travelers looking to get a true taste of Tibet – to commune with its wonderfully rich culture, Buddhist traditions, and Tibetan refugee population – head for the seat of its government in exile since 1960 and the Dalai Lama’s (Tenzin Gyatso’s) adopted hometown in Dharamsala, India, which is decidedly less Indian and distinctly more Tibetan in feel. Here, His Holiness leads the Tibetan community in exile and offers free public Buddhist teachings several times a year. Having recently attended an inspiring series of public talks, which allowed for such close proximity to the revered master that my beau managed to score his personal blessing, here are some tips and practical advice on attending a teaching of a lifetime yourself. How do I Get Tickets? Tickets for the Dalai Lama’s teachings are free to the public (short of a nominal administrative fee), but do require advance in-person registration at the Tibetan Branch Security Office in McLeod Ganj, set just uphill from Dharamsala proper. Official registration starts three days before the teachings begin and ends one day prior to their start; bring along two passport-size photos and your passport. Where Are the Teachings Held? Teachings are conducted at the open-air Tsuglagkhang Temple, accessible via the bustling, vendor-flanked Temple Road; it lies adjacent to the Dalai Lama’s monastery and his off-limits private residence. Expect spinning golden prayer wheels, colorful depictions of Buddhist deities, and pilgrims and monks in various states of prostration and prayer. What Should I Bring Along? Talks can span several hours over numerous days, so bring along a cushion for extra comfort, a sunhat or umbrella, an FM radio with headphones to tune into English translations, and a cup if you’d like tea, customarily poured by local monks. You’ll have to pass through tight security, and cameras, cell phones, and numerous other items are not allowed in, so plan to attend with as little as possible in tow. How do I Reserve a Seat? Floor seating is available on a first-come, first-served basis, though you can gain access to the temple where the teachings are held a day or two in advance to attempt to reserve a spot. Be sure to bring along paper or cloth, tape, and a marker to designate your seat with a placeholder bearing your name (though this practice was only spottily observed during my visit – and less so the closer you got to the star speaker). In theory, the seat you take on the first day is reserved as yours for the duration of the teachings. (Tip: Ask a local in-the-know monk to help guide you on selecting a good spot for viewing His Holiness). What is the Schedule of Teachings? Some half-dozen public teachings are currently scheduled through May 2013: see www.dalailama.com/teachings for the complete lineup. Precise teaching hours are posted a day or two before the talks commence. Making it Happen The Dalai Lama’s public teachings draw thousands of spiritual pilgrims from around the globe – be sure to make lodging arrangements well in advance of arrival. I stayed at the budget-friendly, no-frills Annex Hotel, offering views of forested Himalayan valleys from its rooftop restaurant and rooms, set within a 10-minute walk of the Dalai Lama's temple complex (rates from $18/night). Connecting flights between Delhi and the nearby Gaggal Airport are currently suspended (with Kingfisher Airlines now kaput); alternatively, hire a driver or hook up with a more economical bus connection from throughout northern India (allow 10 to 14 hours in transit from Delhi).